JD Challenger was born in Oklahoma with a creative fire that first began to smolder when he was a very young child. After moving to New Mexico, Challenger enjoyed success as an artist painting landscapes. 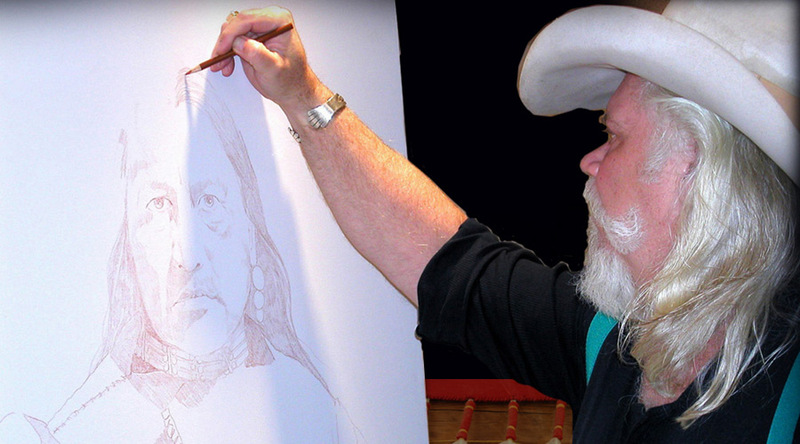 Privately, he continued to draw and paint as he was learning about Native Americans. He was reluctant to show his paintings in public for fear of offending a people he greatly admired. Working in oils and acrylics on canvas, as well as watercolor, his style continued to emerge and his passion grew. Upon witnessing a Ghost Dance ceremony being filmed for a movie, Challenger came face to face with his mission in life. "As I stood there watching the chanting and the dancing, I knew what I wanted to paint... nothing had ever been clearer." His wife, Denise, encouraged him to show his work to his Native American friends, one of whom was a holy man. When he did so, he received their blessing and was told, "There has to be a messenger and he doesn't have to be one of our People. The Creator chooses His own messengers. Your path is to tell our story and educate people about the past and about what is still happening today." Challenger takes his role seriously, but modestly declines credit for his remarkable gifts. "The thing I do best is paint. I prefer to look at it as 'not me' doing it, I'm just the instrument... The Creator, the brush, the paint, and then me. JD Challenger paints the story of a people rich in heritage and traditions; stories sometimes poignant, often angry... but always powerful and demanding to be told. Each portrait speaks its own truth. Challenger is the vessel that paints that truth. copyright 2009-2019 MAINVIEW GALLERY L.L.C.